The GAME Ribbon Blade mixers can be supplied in three parts; the top hopper, the mixer and the under hopper. The ribbon mixer is a batch machine and gives quick blending of pre batched formulations. The mixer can be fabricated from mild or stainless steel and consists of a mixing chamber with a horizontal ribbon assembly, supported off externally mounted plummer block bearings. The ribbon is driven by a geared motor unit. On completion of the mixing cycle the product is discharged via the pneumatically operated bomb door or slide mechanism. 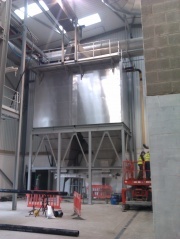 The mixer can be supplied with an optional sparge pipe assembly for liquids additions. The top hopper is used as a holding hopper whilst waiting for the mixing cycle to be completed and is designed to be mounted directly to the top of the mixer body. 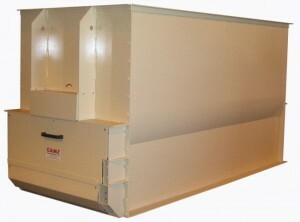 The under hopper is designed to accept a mixed batch of product that has been discharged from the mixer and is ready for transfer by a conveying system. The ribbon blade mixer ranges from 2000 litres up to 6000 litres, with bomb door or single/multiple slides as discharge mechanisms. The client can choose from a range of drive systems. Discharge: the top hopper (holding hopper) discharges to the mixer through a single bomb door mechanism actuated by a pneumatic cylinder and linkage system. The mixer discharges to the under hopper through either a pneumatically operated bomb door or slide mechanism and the under hopper discharges by a conveying system (i.e. screw discharger). Capacity: the hoppers and mixing chamber are designed to hold specific capacities of product and suit set product bulk densities. Each mixer unit is tailored to suit individual client requirements. 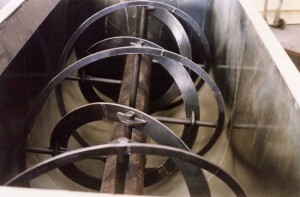 Process: ribbon mixers are capable of performing a variety of mixing operations. These ribbon scrolls are excellent for low density, free flowing materials. Ribbon mixers are designed for thorough end to end mixing. The mixing action occurs by rolling the material back and forth. The GAME design provides a continuous spiral from the end of the mixer to the discharge. There are no gaps in the flighting to interrupt product flow and create “pockets” of stagnant material. In mixes with small agglomerates, the greater shearing action of a ribbon mixer can be beneficial. Sparge pipes (for liquid additions). Dry additions (powder, granular, etc.). Three tier continuous batch mixing (top and bottom in-feed hoppers with level probes, load-cells and screw dischargers). Temperature probes & load cells. The mixing process handles all ingredients in an extremely gentle manner and when they vary in particle structure, size and density the mixing is such that segregation is avoided. Robust and cost effective construction.